Use our free MCAT prep course and learn to study for the MCAT quickly and effectively. Free MCAT practice questions to improve your knowledge and MCAT review. Study with the best MCAT prep books and read our reviews on the best MCAT books. THE BEST MCAT PREP COURSE ONLINE. 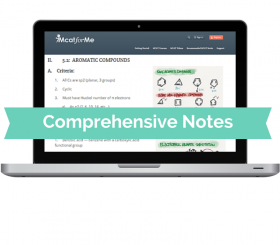 MCAT review made simple & FREE. 10,000 students can’t be wrong? All of our MCAT material has gone through rigorous review and revisions. Over 100 videos made by MCAT experts, plus curated and high quality videos from the web, free! Be flexible with programs that fit around your schedule – two, three, four, and six month programs. High yield flashcards, study guides, notes, and much more to help you ace the MCAT, all for free.